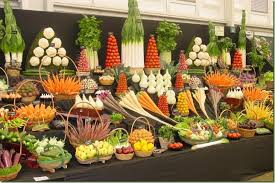 Pick fruit as near to the show time as possible. Handle the fruits as little and as gently as you can, picking them up by their stalks so that the natural bloom where present, (eg. on grapes, plums and some apples) is not spoilt. Use scissors rather then fingers to remove soft fruits. Choose only fruits as near to perfection as can be found, they should be fresh, uniform in size, free from blemishes and characteristic in shape and colour. Apples, pears and gooseberries may be shown either ripe or unripe and all other fruits should be ripe unless otherwise specified in the schedule. 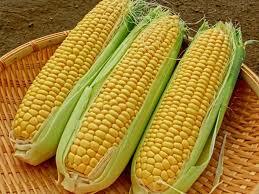 Over-ripeness will be regarded as a defect in any fruit. 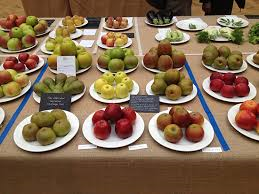 Apples and similar shaped fruits (including some pears), should be staged with the eye uppermost, stalk end downwards, placing one fruit in the centre and the remainder around it. Apples, pears, plums and allied fruits, cherries, apricots, quinces, figs, medlar's, Blackberries,gooseberries, raspberries, loganberries and strawberries must be picked with the stalks intact. Currants, jostaberries, worcesterberries and blueberries should be picked with the strings intact, choosing the longest strings with the largest fruits. Grapes should be picked as a complete bunch and each bunch should be cut with a piece of lateral shoot on either side of the stalk to form a "T" handle. Melons should be cut in the same way. When showing potatoes , the tubers should be carefully washed in ample, clean water with a soft sponge - on no account use a coarse cloth or brush. Stage on plates with the rose end outwards; cover with a cloth to exclude the light until judging commences. 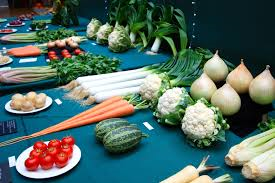 Root vegetables should be carefully washed to remove soil but in no circumstances should oils or similar substances be applied in an attempt to enhance their appearance. Wash with a soft cloth and plenty of water, brushing will damage the skin and spoil the appearance of the exhibit. Root vegetables must have their leaves cut so that approximately 75mm of leaf stalk remains, which should be neatly tied. Lettuces are best lifted in the evening or early morning and the roots should be washed and wrapped in moist tissue and should be displayed with the hearts facing the front. 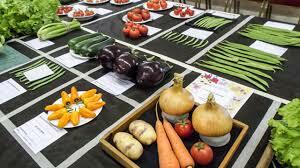 Carrots should have their foliage cut off to a height of 75mm. Rhubarb stalks should be of uniform size and length. The top foliage of natural rhubarb should be cut off leaving approx (3") 75mm from the start of the leaf stalks. However the foliage of forced rhubarb should not be cut off. When showing garlic, clean off any soil fragments and dry completely. reduce the dried stem to about 25mm. 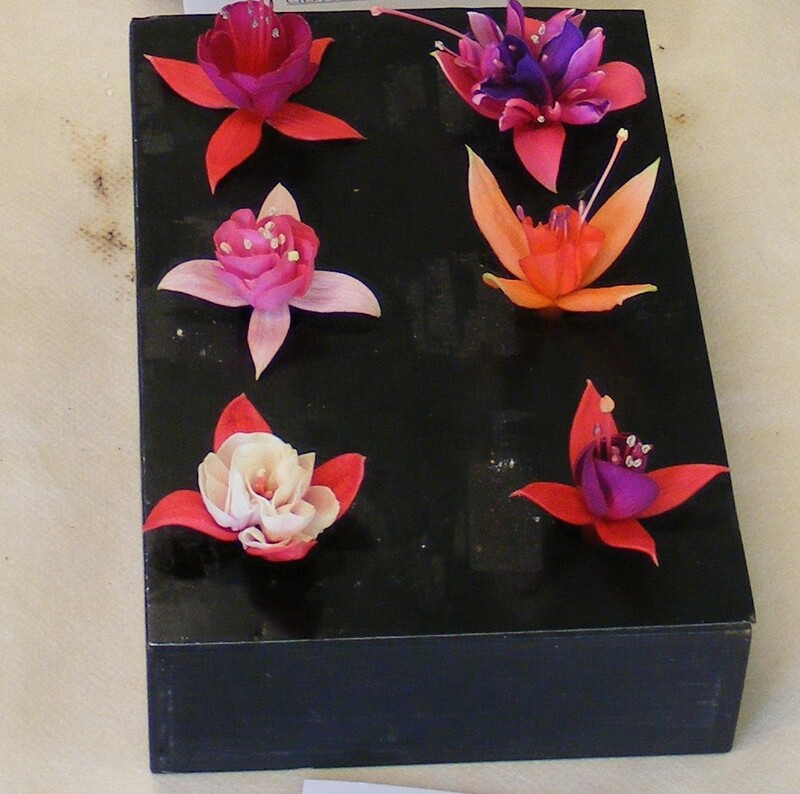 Stage bulbs as complete specimens; do not divide into cloves. Leek specimens should be uniform in length, trim roots neatly ( but still be visible as roots) and the leeks should be solid (ie. firm and compact throughout the length of the barre). Excessive stripping of the outer leaves should be avoided, otherwise unsightly ribbing is exposed. Onions/shallots should be dried (do not skin), and their tops cut off and bound or tied using uncoloured raffia and the roots neatly trimmed back to the basal plate. Onions are often staged on cardboard rings or soft collars. Pickling onions should not have their necks tied. Shallots look better if displayed in sand. Green or red salad onions should be staged with the roots attached and be well washed. Beans and peas should be carefully cut off the vine with scissors leaving some of the stalk attached and whenever possible should be of uniform colour. It is advisable to have one or two pods as spares, just in case. Cabbages and cauliflowers should be shown with at least 75mm of stalk, except in collections and just before staging, trim back the leaves so that they match the level of the outside of the curd. Tomatoes should have their calyxes intact and can be shown on a bed of sand if desired with the calyx uppermost. Make sure that all the flowers are fresh and remove dead flowers and leaves. 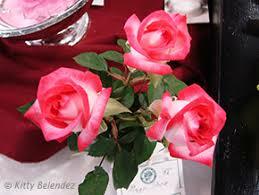 If the schedule call for a single flower then remove any buds as these count as flowers. Check the class requirements if they ask for 6 blooms then make sure you have the correct number in the vase. 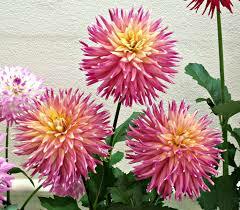 Be aware of sizes of flowers, especially with Dahlias to ensure that they are in the correct class. When exhibiting plants in pots please ensure that there is no dead foliage, moss or weeds in the pot and both pot and saucer are clean. 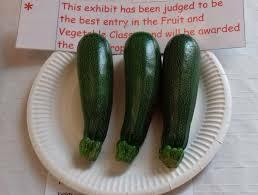 Make sure that your pot plant has sufficient water and is not "light" when picked up by the judges.